By the way, I’m not sure when they did it, but Google Maps has added most of the rest of the world to their satellite imagery, with some choice high-resolution spots right in the Philippines. Here’s Metro Manila, though most of it is sadly blurry, at not as high a resolution as other world locations. If I’m reading the geography right, this is the Ateneo de Manila campus. I don’t know why, but a square of land and water around Cavite and Sangley Point is at high resolution, as well as other areas which I suppose correspond with the locations of the old US bases. 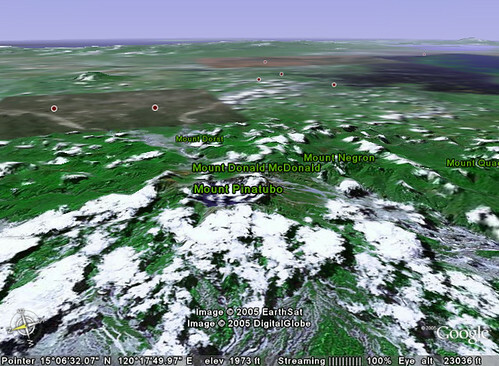 Emelgeek on Flickr has found Mayon Volcano with Google Earth. 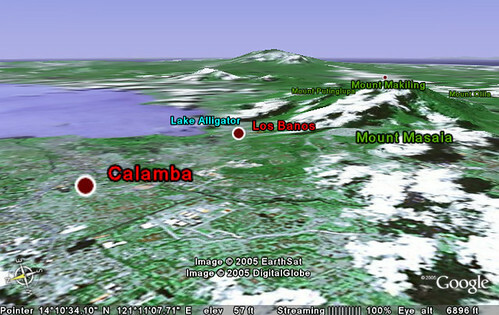 Laguna de Bay around Los Baños and Mount Makiling, with Banahaw and Cristobal in the distance. Mt Pinatubo area, with Clark Airfield and Angeles in the background. Note the name of the neighboring peak.